Both the iPhone and iPad versions of GoodReader underwent upgrades in the past week, adding the ability to annotate documents with notes, highlights, and drawings to the popular PDF-reading apps. 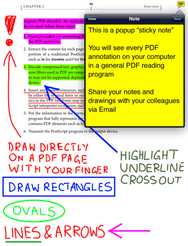 The new features let users make “sticky note” comments, do freehand drawings on documents, and highlight or underline important text. Both versions of GoodReader cost $1 and require iOS 3.0 or later.